An elderly woman was found dead in a fire at R.J. Brooks Living Centre. Bancroft OPP said the fire broke out around 4 a.m. Thursday morning, March 15. Residents were evacuated to the Bancroft Bible Chapel, next to the centre on Hastings Street North. As of March 20, North Hastings Fire Service fire chief Pat Hoover said the cause of the fire was still being investigated. The woman’s name hadn’t been released. Bancroft OPP, Bancroft Fire Department, Ontario Fire Marshal’s Office and the Office of the Chief Coroner are assisting with the investigation. Hastings Quinte Paramedic Services and Hastings County Community and Human Services Bancroft were at the chapel Thursday to assist residents evacuated from the building. A registration desk had been set up in the front room of the chapel. 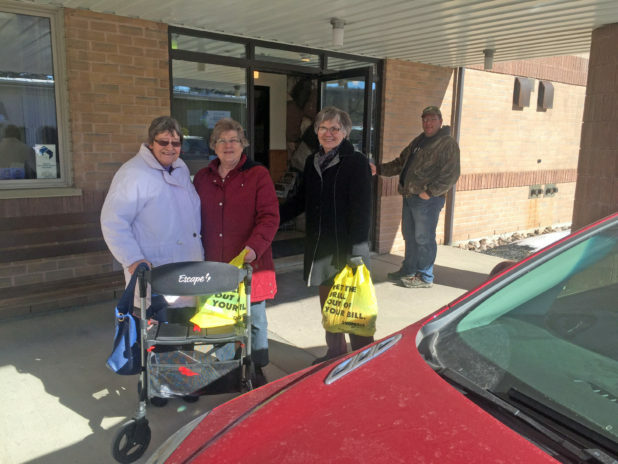 Residents were being escorted back to the centre to get essential items such as morning medications. Hoover said the fire was confined to a unit on the second floor but work needed to return people in a “safe and secure” manner could take time. Around 4 p.m. Saturday afternoon, March 17, residents from 28 units on floors one, three and four were allowed to return to the building. Seven more units would be accessible March 23 and the final four April 3. “We’ve set fairly realistic timelines to have [necessary safety tasks] completed. We’ve aimed a little higher, but that way if it happens early well then it’s great but we don’t want to promise [residents] something and not be able to deliver,” he said. When asked if residents needed anything the day of the fire, Hoover said everything was pretty much looked after. Case supervisor for human services Bancroft Andra Kauffeldt confirmed residents were still in good shape March 20. “It reminded me why I do this work,” Kauffeldt said of what she saw Thursday. She said “complete strangers were walking in” offering their spare bedrooms and businesses stepped up as well. “There were a lot of good, positive, human moments,” she said. According to the fire service, it evacuated each of the centre’s 40 units, which contained 48 occupants. UPDATE: This story has been updated to reflect the combination of updates and full story following the fire that ran in the March 23 issue of Bancroft This Week.